Reading class can be so much more than just opening a book and turning pages. The more fun your students have with written English, the more exited they will be to read. And excitement is a great way to motivate your ESL students, maybe even the best. These games will certainly bring some excitement into your reading classroom. They might also bring some laughs, some energy, and a whole lot of fun. So if you are looking for a new way to get your students reading, try one today. This is a fun and exciting reading race that takes some preparation but that you can use over and over. To play, each student will need a flashlight, and you will need to prepare your classroom. Write each word, phrase, or sentence you want your students to read on a simple paper cutout - stars, balloons, or any other seasonally appropriate cutout. If you like, include some additional phrases for them to read on other cutouts to make the activity more challenging. Then tape all the paper cutouts to your ceiling. When it’s time to play, give each student a flashlight and turn out your classroom lights. Call out one of the phrases on the cutouts. Students then race to find the correct one on the ceiling using their flashlights for a light source. When a student finds the correct reading item, they keep their flashlight on that cutout on the ceiling. Once everyone has found the correct item, give your students another phrase to race to in the same way. One note of caution, the longer your reading passages, the larger cutouts you will need to use. Make sure they are written large enough that your students can read them from their seats. This activity works well for intermediate students and above. You will need some balloons, a reading passage, and room to run for this lively relay race. Start by choosing a passage for your students to read. It might be an original story or a summary of something they have read. In any case, students will be putting the events of this passage in sequential order, so make sure your selection has a clear beginning, middle, and end. Write out your passage on small slips of paper. I find that typing a double spaced list of single sentences works best. You will need one set of sentences for each team that will play. Print them out; then, roll up the slips of paper and place each one in an uninflated balloon. Make sure you keep each set separate. You might even want to use a different color balloon for each team. To play the relay, have teams stand on one side of the room and put each set of balloons across from them on the other side of the room. On your go, one person from each team races to their pile, chooses one balloon, blows it up, pops it, and retrieves the slip of paper inside. They bring that back to their teammates, and the next person takes a turn. Once all the balloons have been popped, students unroll the slips of paper and put the story in sequence. The first team to correctly sequence their story wins the race. If your students are at the age where matchbox cars are a favorite pastime, this is the activity for you. Basically, students will race a car from one end of the track to the other while reading selections along the way. The selections can be as simple (individual words) or as complex (sentences) as is appropriate for your students. If you want to go big, use as much of your classroom space as you like. Take any kind of tape from simple masking tape or colored painting tape to black duct tape (be warned, this stuff is sticky!) to lay out a track around your classroom. (You can also do this on a poster board or bulletin board if you are short on space for students to read and play or you want to use the activity in a reading center.) Once your road is in place, tape off several mandatory pit stops. These stops will have your reading selections. I like to use a manila folder for my passages so students have to stop and lift the cover before reading what is inside. For more advanced students, I include portions of a larger article or story. For beginning students, I limit my reading selections to individual words or shorter sentences. To play, students race their car along the track and stop to read the selection at each pit stop. If you want to make the activity competitive, time each person and shuffle the reading selections among the pit stops for each racer. At the end of the race, you may want students to answer comprehension questions either orally or in writing. Add a 10 second penalty for every wrong answer to each racer’s time. Once everyone has finished racing, the person with the fastest time wins. This simple game will have students following directions as well as putting words, phrases, or sentences in the correct order. For lower level students, prepare the game yourself. For higher level students, you may want each team to prepare the materials for an opposing team. Prepare the game by making one set of reading cards for each team who will be playing the relay. Using card stock or thin cardboard (upcycled cereal boxes work great), create cards that students will have to arrange in the correct order. Simply cut the card stock into squares or rectangles all the same size. The number of pieces you have should equal the number of reading selections you have for your students. For example, if you want the race to be short, cut your cardstock into four identical rectangles and have four reading selections. If you want to make the race longer and the reading activity more complicated, cut your card stock into eight or twelve identical rectangles and use that many reading passages. Write words, phrases, or sentences on each card, depending on the skill level of your students. This is a great way to practice sequencing words or transitional phrases, too. You will hide each of these cards somewhere in your classroom, and you will have to write the location of each card for a clue. I like to use Ping-Pong balls that I can reuse for other activities. On each, I write a phrase using a preposition of location which tells where a card is hidden. For example, under the teacher’s desk, below the window, behind the clock, under the trash can, etc. You can give each team the same set of locations or make individualized directions for each reading selection. Then, hide the cards around your classroom and put each team’s balls into a bag. To play, students run up to their bag, pull a location ball, run and get their clue, and return to their team. Play continues in this way until a team has all their pieces and has put them in the correct order to form a sentence, paragraph, or longer reading selection. Reading really is fun, and the more variety you bring into your classroom, the more fun it will be. 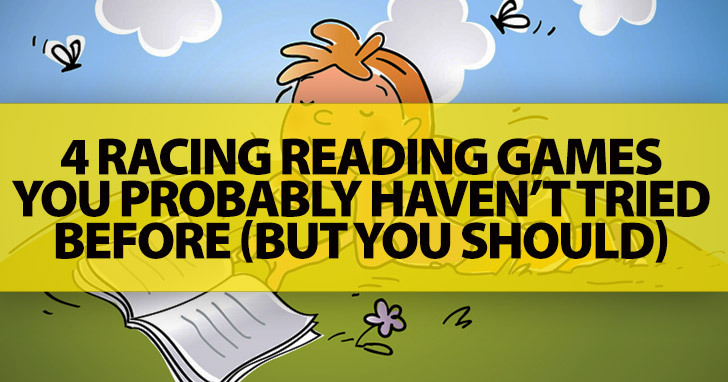 You won’t see these games in every reading classroom, but one thing you will see. The teachers that use these reading games will have students who are excited to read and who tackle reading challenges with a great sense of adventure. Do you have any great and unusual reading games you like to play? Share them in the comments below.